Iran is permitted to pursue the construction of two newly announced nuclear plants under the parameters of last summer’s nuclear agreement, Obama administration officials informed the Washington Free Beacon, setting the stage for Tehran to move forward with construction following orders from President Hassan Rouhani. Ali Salehi, Iran’s top nuclear official, announced on Thursday that Iran has invested $10 billion into the construction of two new nuclear plants after receiving orders from Rouhani, according to reports in Iran’s state-controlled media. A State Department official said to the Free Beacon following the announcement that Iran is allowed to move forward with this venture under the nuclear agreement, which does not prohibit this type of nuclear construction. "The [nuclear deal] does not prevent Iran from pursuing new light-water reactors," a State Department official not authorized to speak on record said to the Free Beacon in response to questions about Iran’s latest announcement. "Any new nuclear reactors in Iran will be subject to its safeguards obligations." Critics in Congress of the Obama administration’s diplomacy with Iran condemned the new nuclear reactors, telling the Free Beacon that the administration is turning a blind eye to the Islamic Republic’s continued pursuit of illicit nuclear technology, including the know-how to build a nuclear weapon. "Nothing in the behavior of the Iranian regime in the year since the JCPOA went into effect should give us any confidence that they will be confining their nuclear program to peaceful activities," Sen. Ted Cruz (R., Texas) said to the Free Beacon, using the official acronym for the nuclear deal. "Secretary Kerry seems to think that the mullahs are interested in curing cancer and civilian energy production, but their rapid progress in ballistic missile technology suggests they are far more determined to develop the nuclear weapons these projectiles are designed to deliver." "This is just the most recent confirmation of how misguided, shortsighted, and downright dangerous the Obama administration’s nuclear deal with the Islamic Republic truly is," Cruz added. Congressional sources familiar with the matter said the administration’s lack of concern about the new nuclear reactors is adding fuel to a growing scandal surrounding White House efforts to grant Iranian demands. Republican lawmakers have been investigating for months information detailing what they say is an Obama administration effort to pay Iran $400 million in cash and another $1.3 billion as part of a ransom payment to free U.S. hostages from Iran earlier this year. Rep. Mike Pompeo (R., Kan.), who has led multiple efforts to compel the administration to come clean about the cash deal, said to the Free Beacon that the White House appears more concerned about bending over backwards for Iran. "While the Iranians complain that the U.S. is not allowing enough investment into Iran, when investments do occur, Tehran continues to focus on its nuclear program. The Iranian regime’s priorities are clear," Pompeo said. "The Ayatollah is more concerned with strengthening Iran’s nuclear infrastructure than providing for the Iranian people. Unfortunately, President Obama’s failed nuclear deal with Iran does little to protect the United States from an eventual Iranian nuclear weapon." In announcing construction of the two new nuclear plants, Iran’s Salehi took aim at the United States, blasting it for combating the Islamic Republic’s efforts to become a nuclear power. 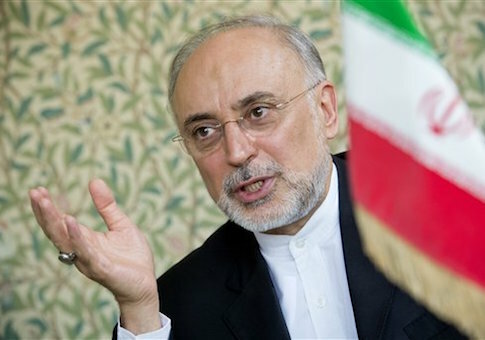 "The U.S. has settled its scores with its potential rivals but Iran has stood up against it," Salehi was quoted as saying. "This is a serious political challenge that does not form in vacuum and requires producing content and ideologies." Salehi also said Iran would continue to produce excess heavy water, a nuclear byproduct that can provide the material for a nuclear weapon. The United States committed to purchasing more than 30 tons of this material from Iran earlier this year in order to keep it in line with restrictions imposed by the nuclear deal. "Iran’s heavy water production surplus is currently on a sale agenda and our nuclear industry is functioning well," Salehi said. One senior congressional adviser who works with a range of key offices on the issue said to the Free Beacon that all of this is part of an Obama administration effort to help Iran become a legitimate player in the global nuclear trade. "The Obama administration seems committed to making Iran into a nuclear power," the source said. "They’ve purchased heavy water from the Iranians, as if the Iranians were legitimate nuclear suppliers, which they’re not. They’ve made excuses for Iran seeking to procure nuclear parts from Germany and elsewhere. And now they’re celebrating Iran building full-blown reactors." "All of this is the exact opposite of what they promised Congress, and for good reason, since Congress is committed to ensuring Iran never gets the infrastructure to be a screw turn away from a nuke," the source said. This entry was posted in National Security and tagged Congress, Iran, Iran Nuclear Deal, Obama Administration. Bookmark the permalink.